Bellcomb’s goal is to make a specialty product that fits a specific application -– and to make that product in quantity. The Minnesota company makes lightweight panels, but much more than a generic blank. Their value-added products may include specialty cutting and boring, custom fasteners and other hardware, adhesives, special shapes, and be ready to install on site. “We define our business as structural lightweight panels for non-aerospace applications,” says David Hartwell, president. The company wanted to expand beyond being solely a supplier of components to other manufacturers, by diversifying and developing products they could sell closer to the customers, so they hired a product development team in 2008. Bellcomb made a major commitment to lightweight stone panels in 2009, purchasing an existing stone fabrication business and moving it to Minnesota that year. Six months later, the company bought a stone fabrication line, with equipment mostly from Italy, and a 125,000 square foot building five miles from their main location near Minneapolis. The stone business includes construction, inside and outside building facades, elevator components, yachts, cruise ships, also high-end RVs. All these applications require the look of stone without the weight. The company uses batch processing in the stone plant, and can use honeycomb on aluminum-skinned panels, or aluminum honeycomb on a fiberglass panel as backer panels to the stone. The stone is shipped to Bellcomb in pieces 3 cm thick from all over the world. On the floor recently was marble from Italy, limestone from Israel, and sandstone and granite from India. “There’s virtually no stone that we can’t use,” Hartwell says. Lightweight panels haven’t seen the same penetration in furniture -– yet. “It’s a niche business,” Hartwell says. “In the mid 2000s everyone was on the furniture market,” Hartwell says. “Ikea created some of that. There were big volumes but not a tremendous diversity of product there. “Frankly, the edge closeout and fastening systems haven’t advanced far enough to make it easy. So the Ikea model of doing large runs is great, but if you’re a cabinet shop (making) fewer cabinets and you have to come up with a new line of 20 a month, coming up with that fastener and closeout systems is a real challenge. 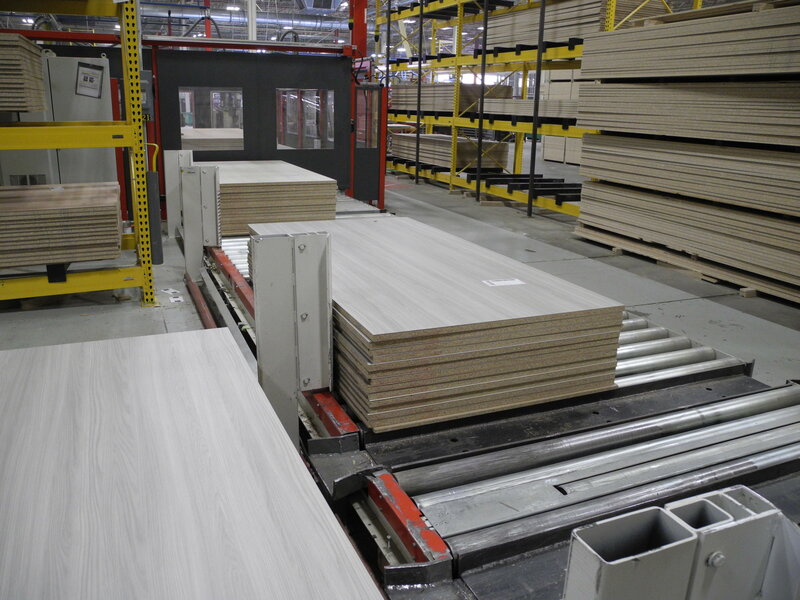 “There’s a tremendous enthusiasm (in lightweight panels for furniture), but the reality is that there are challenges in the fastening and connection systems, and in closeout systems. People didn’t realize how tough it was. It’s pretty easy to make a 4 x 8 panel of MDF and paper honeycomb. But you start to add a frame, and put it in after the fact, it’s challenging. 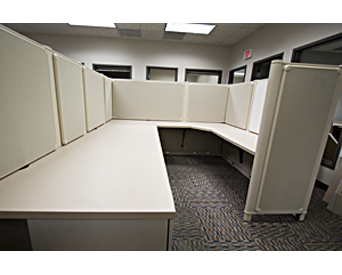 One place lightweight panels will be used is in Bellcomb’s own office furniture line. The company is developing a line of structural but lightweight office cubicles based on a honeycomb panel that will be easy to assemble and disassemble. The line will have fabric, whiteboard or cork skins that are quickly replaceable in the event of a change in taste or damage without having to take it the cubicles apart. The system is based on post construction, making changes in height or direction very simple. And it is designed to be assembled without any tools at all. And it will be offered with all normal accessories and electrical service. Hartwell says that they had considered many product lines, and is looking for opportunities where it has not been feasible to enter the supply chain and instead, becoming a product supplier directly to a customer. There are places where a partnership with an end-product manufacturer is the best strategy and Bellcomb still pursues these relationships aggressively. Walking around the Bellcomb’s primary 120,000 square foot plant there are many different applications for a wide variety of customers. They are boring, cutting to length, perforating thousands of holes, making many modifications for transportation, precision medical products, marine industry and construction. Tighter tolerances are key. Parts are assembled from many different vendors here. Bellcomb makes its own paper and aluminum honeycomb in house from rolls of paper or sheets of aluminum, cutting it into strips and then bonding them together. Bellcomb uses 25 different adhesives, depending on application, including hot melt, urethane, and epoxy. An on-site lab tests different adhesive, material configurations, and performs failure analysis. The plant has a lot of metalworking capacity including welding, cut to length and machining capabilities, and a room with large thermal fluid heating equipment just to heat all of the presses. 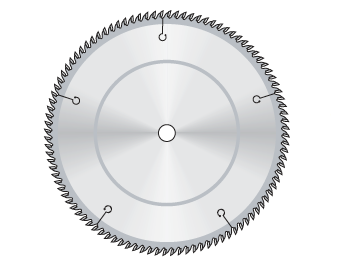 Some woodworking equipment has been modified for lightweight panel construction, including a Jenkins double-end tenoner custom made to process aluminum honeycomb panels. A modified Holzma panel saw, modified, Burkle press, several large Northwood routers, including a twin-table 8 x 12 router, two boring machines, Homag and Holz-Her edgebanders are also used here. What would boost lightweight panel use in furniture and elsewhere? High gasoline prices. “Eight dollar a gallon fuel would drive demand,” Hartwell says. “That would drive investment in technology to reduce weight for honeycomb panels in general. “I believe over time there will be a move to more lightweight panels,” he says. “As volume goes up, price goes down. With time, you’re going to see more and more adoption, but it will be incremental. There will be early adopters that will develop a unique system for a product line, and adopt it for the next one, and others will copy. Passion, ingenuity and integrity are on Bellcomb’s logo. “Someone said, ‘You have to specialize in the impossible.’ You cannot say I’m just going to do what everyone else does. You have to have passion to push the envelope. We’re coming up with new products, new applications, new fasteners, new ways all the time. Our customers demand it of us.